It’s not going to make you a devil in the skies, but this big hunk o’ rust could just be the ultimate in Elvis memorabilia. 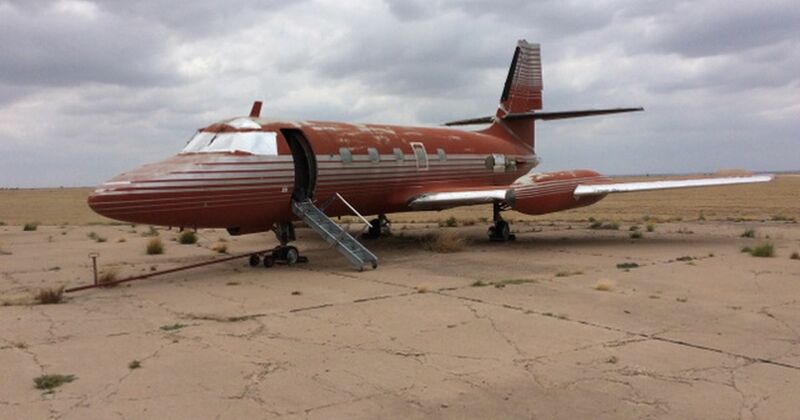 The rotting private jet belonged to the late King of Rock ’n’ Roll – and has been put up for sale after 36 years languishing on a remote airstrip in New Mexico, USA. The 1962 Lockheed Jetstar, which the singer named Hound Dog, has not been touched since it carried Elvis at the height of his fame. Its interior still has the plush red velvet seats, shag pile carpet, teak woodwork, gold-plated taps and marble sink designed by the flamboyant rocker. But any buyer hoping to be all shook up after handing over their notes may be disappointed – the plane has no engines. Its cockpit is also falling to pieces, with the pilots’ seats ripped and rotting. The forlorn jet sold last year for £330,000 and is now being auctioned again by online sales firm IronPlanet. Elvis bought the plane with his dad Vernon for £680,000, according to America’s Federal Aviation Authority. It is the only plane owned by The King that is still in private hands. Two others – a second Jetstar named the Hound Dog II and a 1958 Convair named after daughter Lisa Marie – are at the tragic star’s Graceland estate in Memphis, Tennessee, where he died of a heart attack in 1977 at the age of just 42. The Jetstar was a favourite of celebs in the 1960s, with other famous owners including crooner Frank Sinatra.